True story: I am an unabashed bookworm, with a strong penchant for fantasy and science fiction. 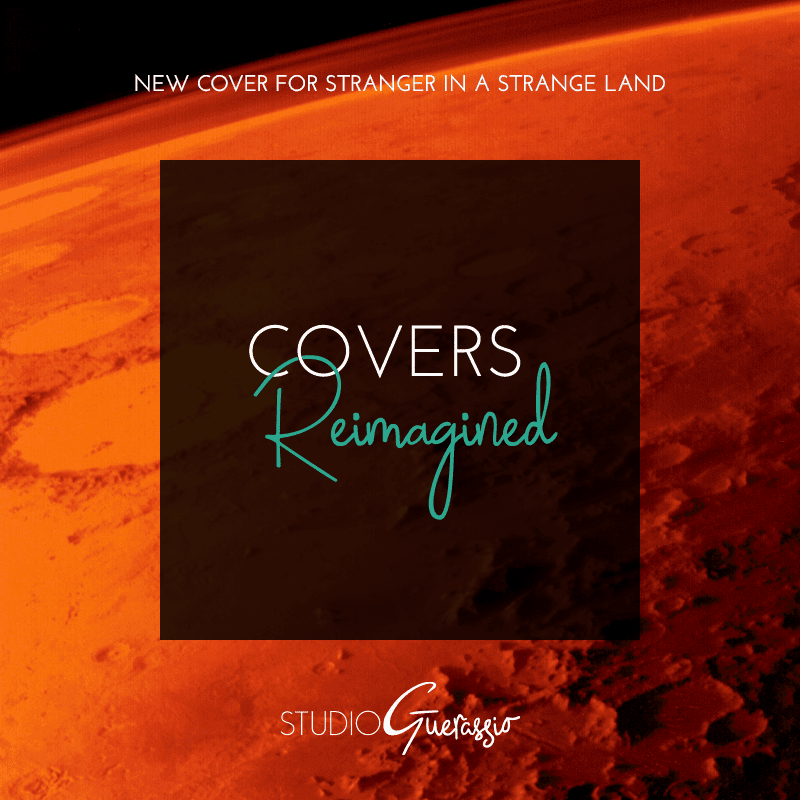 So when I was thinking up books to use in this Covers Reimagined series (welcome to the first post! ), a lot of the books fell into that genre. 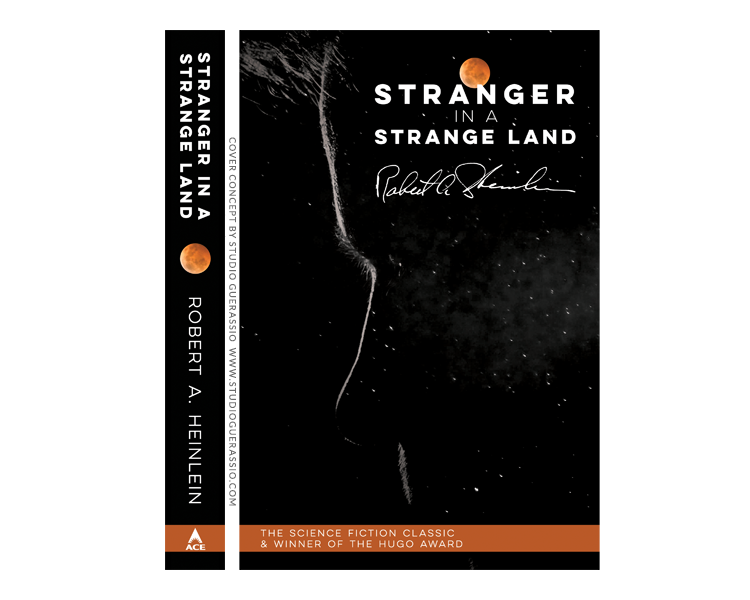 The one I decided to start with, and that I’m sharing today, is a science fiction classic: Stranger in a Strange Land, by Robert A. Heinlein. It’s the story of Valentine Michael Smith, a human who was born on Mars, raised by Martians and then returned to Earth in his adulthood. Seeing all of the customs and behaviors and politics and nonsense of humanity filtered through his outsider’s eyes makes for a very thought-provoking read. Michael, though human, has some otherworldly powers and a deep connection with all living organisms. He also has some unconventional ideas about love, relationships, money, religion, and death. Depending on your mood or mindset, you might find it beautiful or weird. 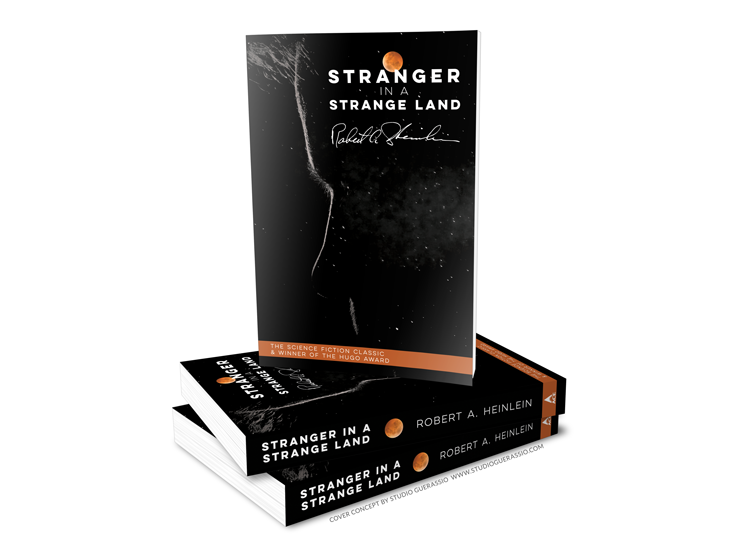 Either way, Stranger in a Strange Land is considered a classic of literary science fiction. It also won the Hugo Award for Best Novel in 1962, and was the first science fiction novel to make the NYT’s bestseller list. The one on the far left is the most common/famous cover. And there are lots of sci-fi appropriate illustrations across the lot. I’m not sure what’s going on with the green one. And the one on the far right, while interesting and of a more literary fiction feel, I don’t think conveys anything specific to this story. But you can see, they pretty much all have a 60’s or pulp sci-fi feel. Which is fair, since the book was originally published in the 1960’s. But I thought it was time for an update. A man’s lit facial profile against a starry sky backdrop, with stark type and a red-orange planet* accent point. The author’s actual signature used for type contrast on the front, then set in more readable type on the spine. A banner in the same red-orange on the bottom to tie in to the color accent, and highlight the award-winning nature of the book. I choose to go photo-based, because a) I like photo-based covers! and b) I’m not an illustrator or painter or anything, so Creative Commons photos are my main source of usable image material for fun projects like these. A type-only cover is also certainly an option, but it wasn’t the direction I wanted to go with this redo. 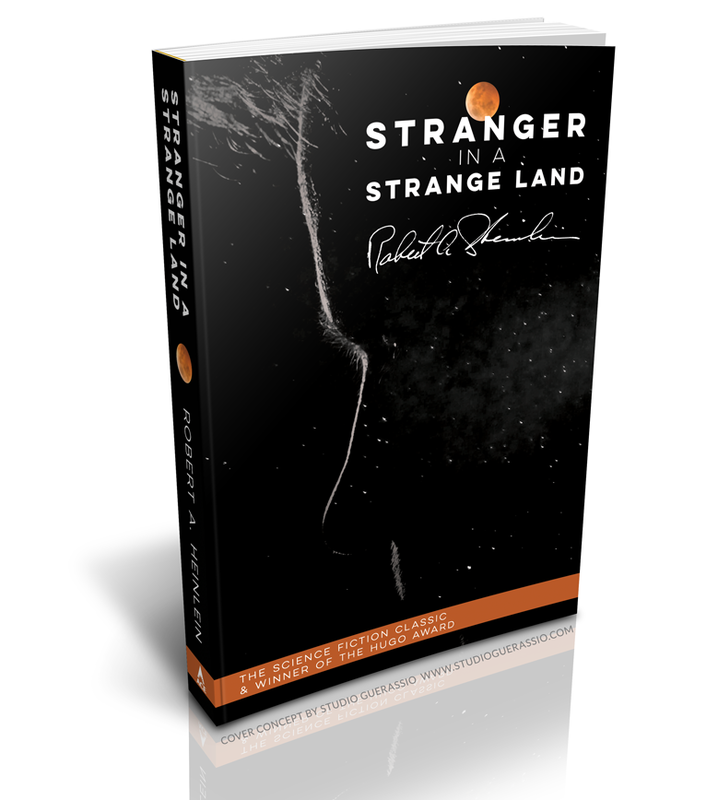 Since Michael is the main character, the ‘Stranger’ referenced in the title, and definitely the driving force behind the entire book, I wanted to include a representation of him on the cover. A lit profile silhouette like this is clear enough to convey that it’s a guy, and at that large cover-spanning size that he is an important character. But it’s still vague enough not to conflict with the book description of hair color, eye color, etc. (which to be honest, I didn’t remember as it’s been awhile since I read this). I also wanted to convey that this was in the sci-fi genre, but not in the lurid manner of some of the old covers. 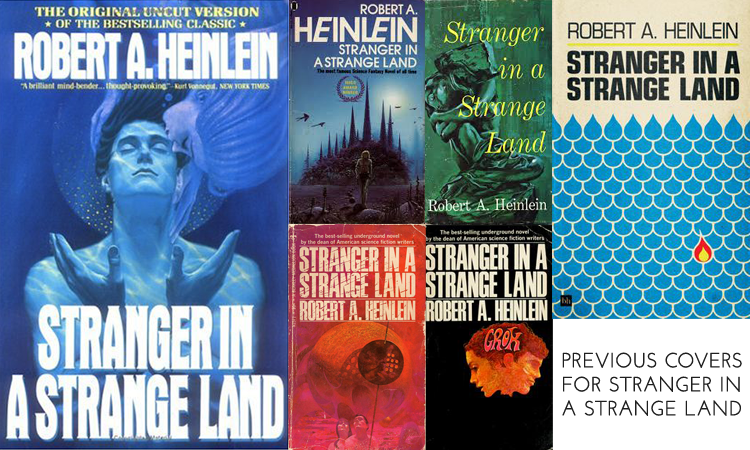 It is what I would consider high-concept science fiction, and I don’t think the previous covers did justice to that. Another consideration: a dark background would work best given the silhouette I wanted to use. A sparse starry sky and the small planet are clear references to space that accomplish all of that nicely. Overall, I’m really happy with how this turned out. And, if I do say so myself, if I saw a cover like this in store, I’d pick it up to read more. What do you think? A modern reimagining that does the story proud? *Ok, it’s actually a photo of a blood moon because it turns out there aren’t a lot of photos of Mars on Creative Commons. Whatevs. It works. If you are an indie or self-pub author looking for a book cover design & more, I have just the thing: The Pageturner design bundle, for everything you need to pimp your book.